A Taser representative demonstrating the company’s X26 model in England, 2007 (it is currently unclear which type of electroshock weapon was used in the Philadelphia incident). A “Taser-style device” set a man’s clothing on fire on South Street in Philadelphia early Saturday morning after a security guard attempted to stun him, the Philadelphia Inquirer reported this weekend. Details on the incident are limited, but a video posted to Twitter shows that the man’s pants caught fire after an electroshock weapon was fired outside Jim’s Steaks, a local cheesesteak restaurant. According to the Inquirer, the restaurant’s president, Ken Silver, said that it was also captured by security cameras. Such incidents are not particularly common given how widespread Tasers and similar products are; in 2015, the Washington Post reported Tasers are used by over 17,000 U.S. police departments and fired at least 900 times a day. But fires have happened before. 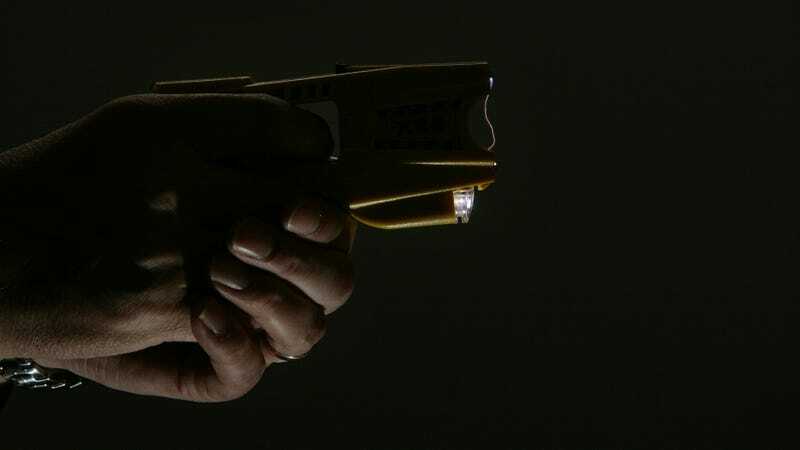 The New Statesman reported in 2017 that a number of deaths have been linked to “Taser-initiated combustion,” with Axon Enterprises (formerly known as Taser International) saying that nine deaths had been counted since 1993. Those deaths included times when police fired the devices on people who had been covered in gasoline, as well as 2012 incident near San Diego when a U.S. Border Patrol officer fired a Taser into a car with spilled gas inside, killing 24-year-old Alex Martin. The paper wrote that “news reports show uncounted other incidents” in which fires were initiated, but did not result in death.